The FENEIS crew: In the first row, sitting, from left to right: Deaf Collaborators Elomena, Patrícia, Silvia, Mirtes, and Juliana. (Silvia is the Deaf Representative of FENEIS in the state of Sao Paulo). Second row, standing, from left to right: Sandro, Jair, Ricardo, and Eduardo, who is the Deaf National Coordinator of Brazilian Sign Language Courses and is also the coordinator of the Deaf sign-editing team working on the Dictionary. The Dictionary has been a labor of love and a great deal of work for the past three years. First, it was compiled, illustrated, and typed in SignWriting by a team of nine hearing people at the University of Sao Paulo (mostly graduate and undergraduate Psychology students) who have been working steadily over the past three years on the dictionary project. Walkiria is the coordinator of the hearing crew, and I (Fernando Capovilla) am the coordinator of the entire project. Then, once the thick document was ready for editing, the Deaf editing team from FENEIS began editing the dictionary, offering their advice and guidance, since they are native to Brazilian Sign Language. Once a week, for the past 11 months, Walkiria and Renato, members of the hearing team, go to FENEIS (the Deaf Federation) to meet with the Deaf crew members depicted in the photo, in addition to other deaf volunteers. In the meantime, the remaining hearing team members at the University of Sao Paulo keep on working on the project, non-stop, in an assembly-line fashion. These meetings between both deaf and hearing crews have the purpose of making sure the Brazilian Sign Language Dictionary turns out as valid, reliable and complete as possible. So far, this cooperation between the hearing and the deaf worlds has resulted in a superb achievement. We are confident that this dictionary is going to make a great difference in the lives of thousands of deaf children in Brazil. Hello. My name is Fernando Capovilla. I am a PhD in Experimental Psychology, and a Psychology Professor at the Institute of Psychology of the University of Sao Paulo (Sao Paulo, Brazil), where I have created the Cognitive Neuropsycholinguistics Laboratory. I also work as Brazil Representative at the International Society for Alternative Communication, and editor of a scientific periodical published the Institute of Psychology titled Ciencia Cognitiva: Teoria, Pesquisa e Aplicacao (Cognitive Science: Theory, Research and Application). Over the last ten years I have developed multimedia communication systems that run in computer networks for the purpose of allowing deaf amputees (as well as deaf people with cervical spinal cord injury) to communicate. The systems allow the selection of animated signs from Brazilian Sign Language via touch-sensitive screens as well as via air-puff, eye-blink, eye-gaze, etc (I have also computerized a number of symbol and sign set systems for the cerebral-palsied such as Blissymbolics, Johnson's Picture Communication Symbols, Maharaj's Pictogram Ideogram Communication Symbols, etc., besides dozens of computerized procedures for cognitive assessment and treatment of aphasics, dyslexics, etc). Once the messages have been composed via sign selection, they can be both printed and spoken (via digitized voice output) in both Portuguese and English. Thus, my systems allow a Brazilian deaf person to communicate both directly face-to-face as well as remotely (via netware) with an American Deaf person, as well as with a Brazilian or American blind person, even if the Brazilian deaf is confined to a wheelchair with no hand or body movements. The systems also register all the interaction in real time, thus allowing studies of dyad extended "naturalistic" interaction. One of the main advantages is that the deaf persons do not need to give up their sign language when they need to communicate over the phone (as in the text telephones). Another advantage is the transcoding between Brazilian and American sign language signs, which does not happen yet when deaf people communicate abroad using a videotext. Even so, this technology is recent and there are a num,ber of fascinating problems, especially those concerning the spatial syntax of sign languages, and how to encode it using a computer system. (Perhaps SignWriting can help with that, if we can devise a cross-indexing system along with word prediction, based on SignWriting units. I have to study further SignWriting and most certainly must benefit from discussing with the colleagues who have been working with SignWriting for a long time). artist who does the illustrations). The reason why I have created the periodical Cognitive Science: Theory, Research and Application is to serve as a vehicle to publish the several dozens of experiments that we have conducted on the efficacy on these systems with users with different characteristics (sensory, motor and cognitive). (The periodical is published every semester and has 440 pages, so you can see that the work has been quite intense and proficuous... My theoretical background in in information processing, and I am interested in cognitive processing of information by the deaf, such as working memory processes of quiro-articulatory covert rehearsal, imagery and linguistic processes, etc.). Last January my students and I published a Brazilian Sign Language Handbook (Manual ilustrado de sinais e sistema de comunicacao em rede para surdos) that also describes one of our netware multimedia communication systems. By selling the book I obtained funds to pay deaf informants, and over the last 8 months my students and I have been documenting 3200 Brazilian Sign Language signs in a new 600 page Dictionary (which is in the final phase of creation). The signs are drawn in three to five stages of movement, they are accompanied by arrows, and a thorough morphological description. We are very, very glad of coming to the very last phase of a very tiresome work. Even so, I always felt that a sign notation system was missing. Already in the first handbook, I stressed the need of such a system. But it was not until two weeks ago that I found the SignWriting Site. You can imagine just how extactic I was! It was all that I had dreamt of! I could finally write the signs from our dictionary, and thus contribute to the consolidation of Brazilian Sign Language (especially because one of my research projects includes travelling all over this continental-size country and documenting dialects from different states, including all of them in a comprehensive Sign Language Dictionary that rescues signs used in different remote regions of this country, so as to document the richness and imense diversity of this language). I just had to come to know better that system. I tried to make contact with some fellow countrypersons about it, but unfortunately at that time there was no information available (perhaps they were travelling, perhaps their emails have changed, I don't know). No information, until someone finally answered my calls for information. And that was precisely Valerie Sutton herself! I have sent Valerie the periodical and the handbook, and promissed her to send her the dictionary as soon as it is published (about Feb-March 99 in paper, and a bit later in CD format with with animated signs). In exchange, she promissed to send the last version of SignWriting adapted to Portuguese. With this system, should it prove feasible, my crew of 25 students (6 at the doctoral level, 3 at the master's, 2 at the post-doc level, and the remaining at the scientific initiation level) and I will work hard on transcribing the 3200 signs of our dictionary using SignWriting. Guilherme (graduate student with a thesis on sign iconicity). We have a tremendous amount of energy, and despite not knowing everything, we are more than competent to learn everything, provided that the attitudes of scientific curiosity and the desire of creating something of true functional value are maintained. Well, that's it for now. Valerie asked me to send a message to the list telling the list members about the work that we intend to conduct together. I hope I could give you some hints for a start. I certainly have quite a lot to learn from you. Valerie wrote: In the past Deaf people never wrote in their native language, so even though they are native signers, and even if they know the SignWriting symbols fluently, it doesn't always mean that they will automatically know how to write their native language. That takes training, and they did not learn this in school. In fact, they were told just the opposite - that all writing was "spoken language" so therefore they start to think in a spoken language when they pick up a pencil - and they don't even realize it themselves. But slowly, if they write signs more and more, that changes. In other words, this is a process and a complex one. and signers. Writing (either alphabetic, ideographic or SignWriting) is completely different, and requires systematic training and awareness about the fundamental properties of the language being represented in writing. (there's plenty of evidence about that in Galaburda's From reading to neurons, 1989, among so many sources). In my lab we have developed training procedures involving phonological awareness of hearing K1-2nd grade kids, and have proven the wonderfully strong impact of those training procedures upon reading and writing abilities (of the Portuguese alphabetic orthography). These findings tend to be robust and are quite well established in the majority of spoken languages. I think that something very similar to the phonological awareness training could be done with respect to sign language using SignWriting. I am very interested in the fundamental morphological and phonological aspects of sign language (such as described by Klima & Bellugi, 1979), in the nature of systematic training procedures devised to increase the awareness about them, and in the assessment of the consequences of that training in increasing the abilities of writing signs by means of SignWriting, along with its eventual transfer to writing in an alphabetical code. That seems to be promising research. 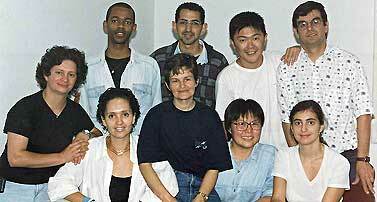 Photo Left: The crew at the Neuropsycholinguistics Laboratory at the University of Sao Paulo. From left to right, Renato (undergraduate research fellow), Marcia (undergrad research assistant), Walkiria (lab psychologist), and Sylvia (a Deaf member of the University of Sao Paulo crew in charge of SignWriting). I'd like to establish contact with researchers interested in cognitive processing in the deaf (e.g., 1. the nature of covert rehearsal of information in the working memory of the deaf -- and the eventual involvement of Baddeley's visual spatial sketchboard, 2. cognitive models of information processing in the deaf with respect to sign encoding and decoding, 3. sign processing in the deaf aphasics, etc. like in Poizner, Klima & Bellugi's 1987 What the hands reveal about the brain), as well as in phonological awareness training in the deaf child as a means of increasing reading and writing performance in SignWriting. (SL phonology in the sense used by Ronnie Wilbur, for instance, in Wilbur's 1984 Why syllables? What the notion means for ASL research, In: Fischer & Siple, Theoretical issues in sign language research). Good news: After lots of grant applications, we have secured the scholarship for the artist who's performing the illustrations, as well as three from the eight scholarships that we had for the research team. Thus, it seems that, despite all the terror and turmoil brought by the economic crisis, and in spite of the ubiquitous grant cuts that have been prescribed by the IMF (which, by the way is far sharper than Ockham or the French guillotine when it comes to razors...) as arsenic medicine to kill the patient (ops, I mean, the disease...), we'll be able to finish our Brazilian Sign Language Dictionary after all, even though with a much smaller financed research team. At the Neuropsycholinguistics Laboratory at the University of Sao Paulo. From left to right the doctoral students: Valeria (thesis on alternative communication for cerebral-palsy), Alessandra (thesis on neuropsychology of reading intervention) and Elizeu (thesis on neuropsychology of reading assessment). And Fernando (advisor and lab head) between these two. The nice thing is that we already have 3200 signs fully described in their morphology and meticulously illustrated in great real-life drawings. About 1500 of them have already been fully reviewed and approved of by the National Federation for the Education and Integration of the Deaf. Our weekly sistematic review sessions at the NFEID office are progressing well, and they have been giving us full support. Our SignWriting team is also progressing well. The problem with the SW task is that we can only start working on writing the signs from a new letter when all of them have been fully reviewed and approved of by that Federation so as to avoid redoing the same sign over and over for the nth time. An additional good news is this: In order to foster visual processing and increase the appeal for deaf children of our thick, scientific, technical and stern dictionary, we are adding to SignWriting not only real life illustrations of the signs themselves but also great illustrations of the sign meanings. There's no doubt that this is going to make the dictionary not only more attractive and appealing for the users, but also more effective for the purpose of sign recognition, learning and fixation. The work is insane, but in the end we'll really have made something good and useful, pleasing to the mind, the spirit and the eye.